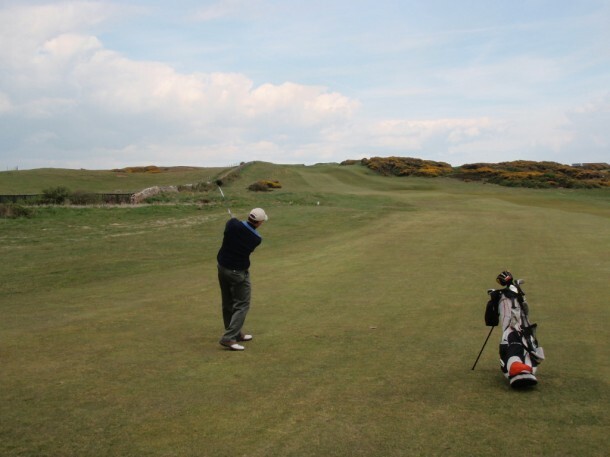 In May, 2010, a friend and I decided to experience golf in Wales. We had traveled to the courses of Scotland and Ireland in prior years, and having a love for links golf we wanted to play the courses throughout Wales. 215,000 steps later and we had played many of the great Welsh tracks along with a few gems in England. When we travel to play golf, we play golf. On this trip it amounted to 15 rounds in 8 days – epic! We started the journey by driving from Heathrow Airport to play Southerndown, then Tenby, Pennard, Machynys Peninsula, Royal Porthcawl, Porthmadog, Nefyn, Pwllheli, Royal St. David’s, Aberdovey, Royal Lytham and St.Annes, Royal Liverpool, North Wales, Conwy and The Grove before heading back to Heathrow and home. I walk the course most every time I play golf unless it is not permitted. On this trip I wore a pedometer each day while we were golfing in order to track how much walking the trip would entail. We figured that each step is about a yard, so the total for the trip was just shy of 125 miles! Now if we had hit the ball a bit straighter the distance could have been less. Wales has some wonderful courses, so I will highlight a few and include some pictures. 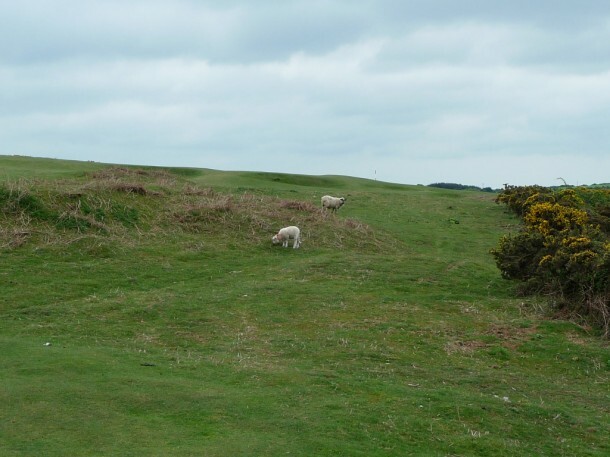 While not a true links course, Southerndown is a challenging, fun golf course up and down hills with links style hazards including gorse and even sheep! Overall Southerndown is a very good test of your game. Here is the approach to the second hole. We traveled to Tenby the following day. This is a picture of the par four 3rd hole. 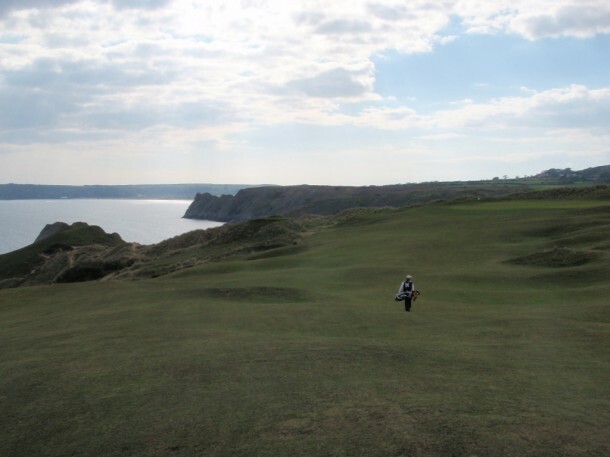 The downhill Par 3 17th at Tenby. The afternoon took us to Pennard, “The Links in the Sky”. 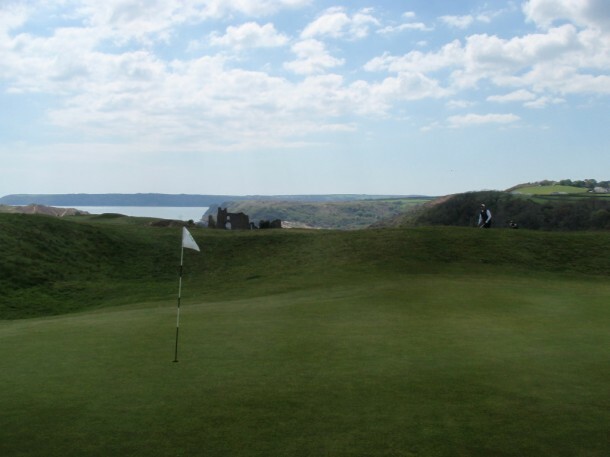 Pennard is an incredible golf course that inspires you to play it over and over again. After a short introduction from Mike the Pro we were off to take on the tumbling fairways and interesting green complexes. The challenging 7th green at Pennard. 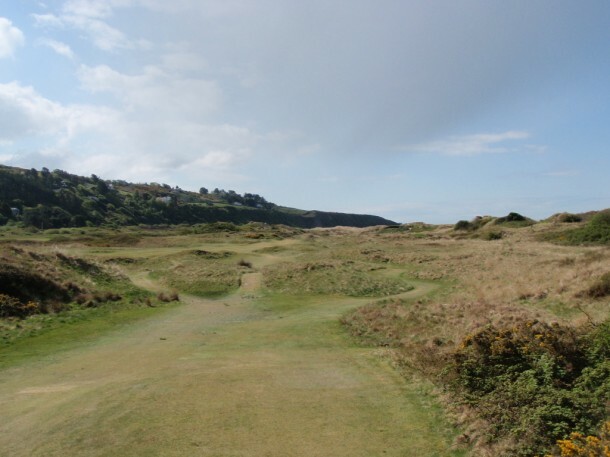 A walk down a fairway at Pennard. 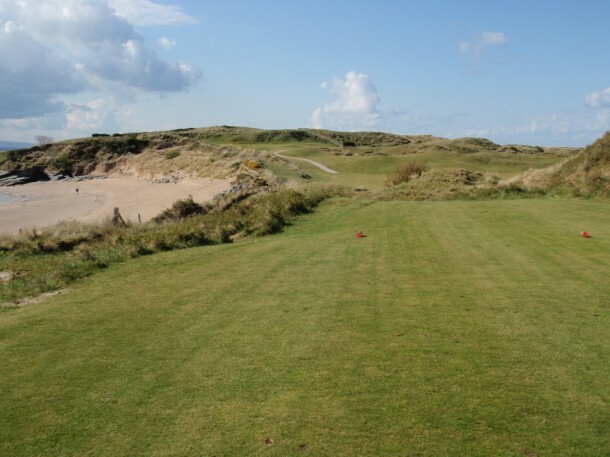 The next day we started at Machynys Peninsula, a Jack Nicklaus design, which is a likable course but we both decided it was similar to any resort golf course you could play in the U.S.
Next stop on the agenda – Royal Porthcawl. Royal Porthcawl is a true links course and should not to be missed on a trip to Wales. The course has some very tough par threes, firm ground and windy conditions which made it one of the most memorable rounds of the trip. Second shot on an uphill par five. One of the well guarded one shotters. The next day we arrived at Porthmadog before the course opened, but were allowed to play at the blessing of the green keeper. 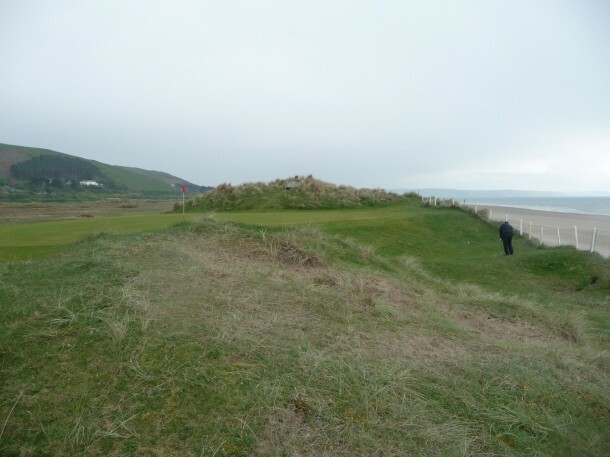 Porthmadog has rather bland opening holes followed by a stretch of fun holes in the dunes which lead to several mediocre parkland holes to finish. The sporty 12th hole at Porthmadog, par 4 –358 yards. 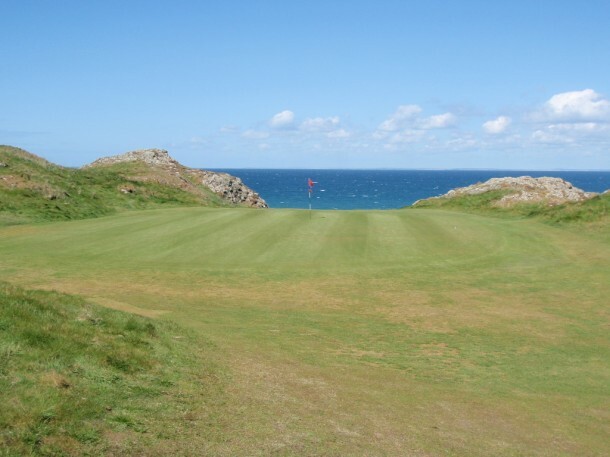 From Porthmadog we traveled to Nefyn and District Golf Club which is a course that gets mixed reviews. While not the strongest test of golf the views are spectacular. Here are a couple sample holes. Tee shot from the second hole at Nefyn. Tee shot on the 13th hole at Nefyn. The 13th green at Nefyn. 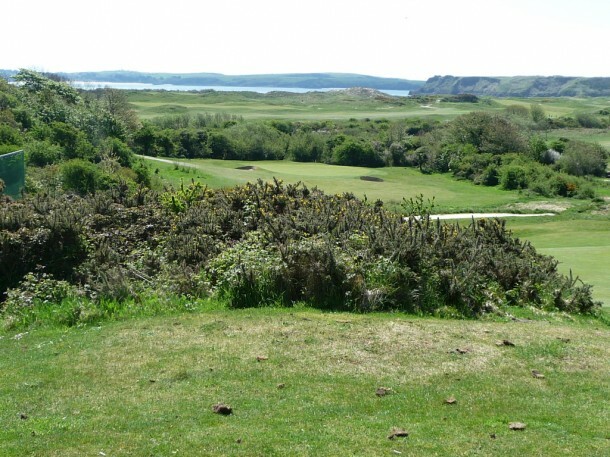 From Nefyn we decided we had not played enough so we headed to Pwllheli Golf Club for a third round of the day. The course is another mix of parkland holes at the start and finish and fun true links golf in the middle. Next up after a good nights sleep is Royal St. David’s or Harlech. 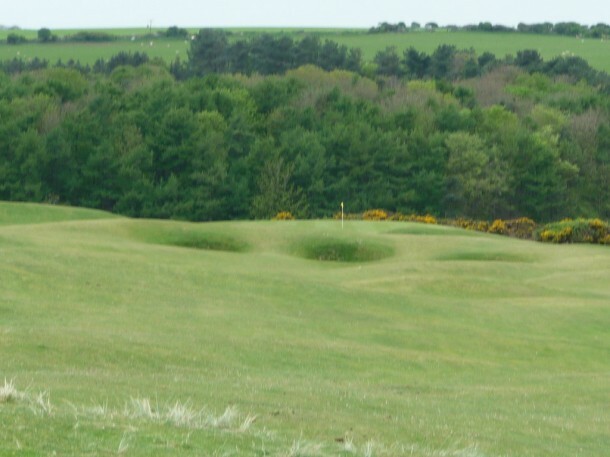 This is another very good course with holes that meander through heath and dunes. Unfortunately there are not more holes in the spectacular dunes that border the golf course. A trip down the road a ways brings us to Aberdovey a links course that plays true to the style with wind, rain and firm conditions. Chipping up to the par three 12th at Aberdovey. Since we were “in the area” we had to check out two of the Open Championship courses in Royal Liverpool and Royal Lytham and St. Annes. These were two highlights of the trip. 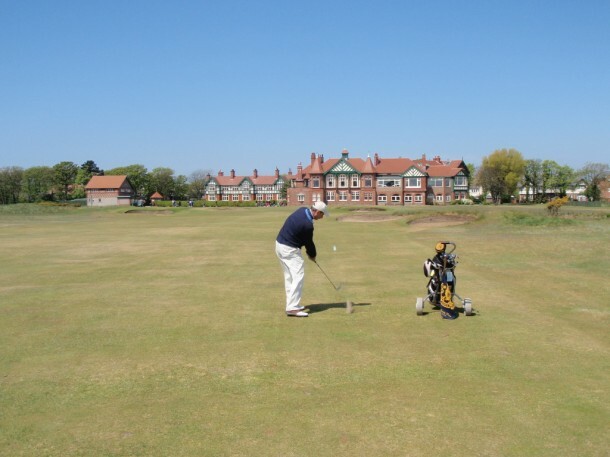 Lytham will be hosting the Open Championship in 2012 and I look forward to watching the tournament. 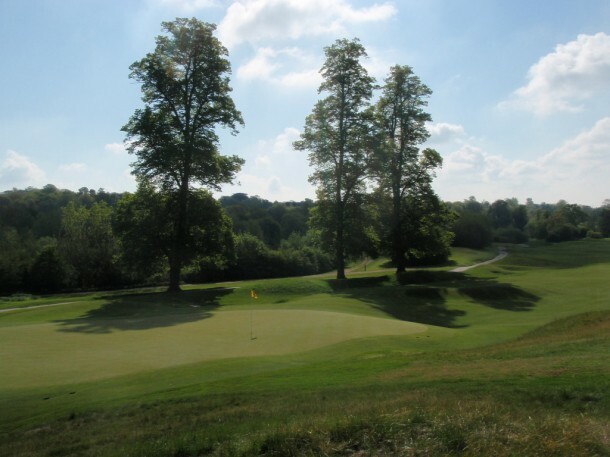 The course is very difficult, well bunkered and makes you think on every shot. 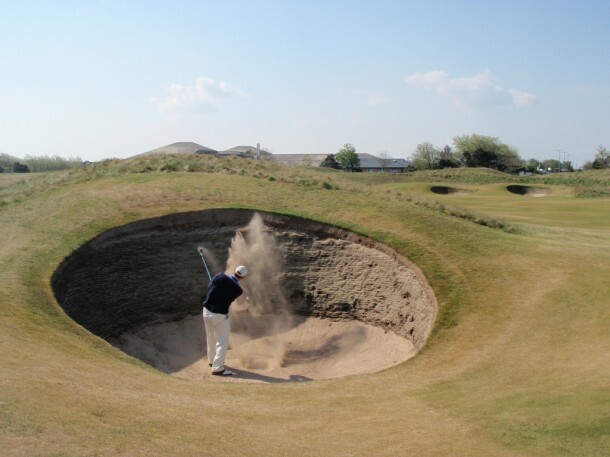 Blasting out of a fairway bunker at Lytham. A par 3 at Lytham. 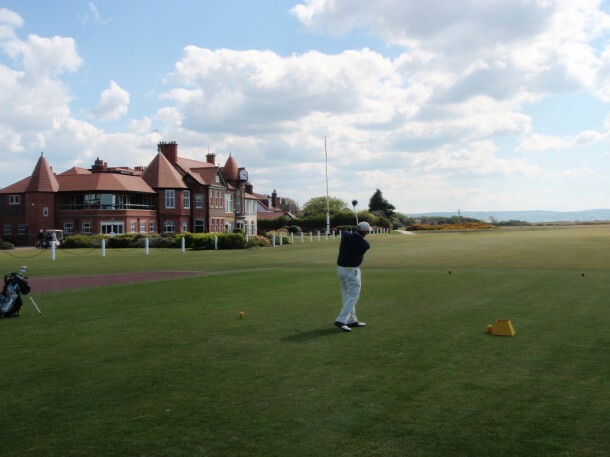 Coming home on the 18th at Lytham with the clubhouse as the backdrop. 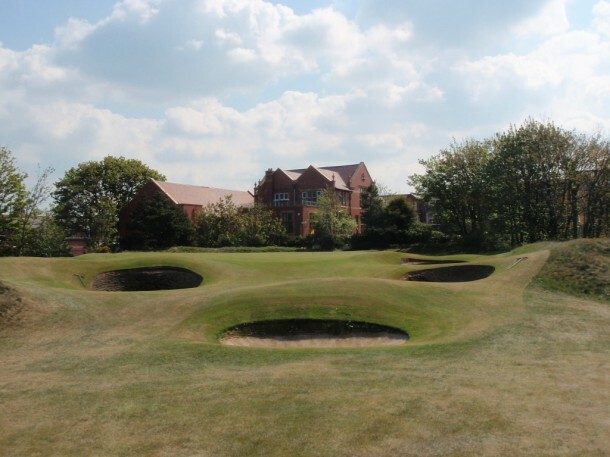 The first hole and historic clubhouse at Royal Liverpool. 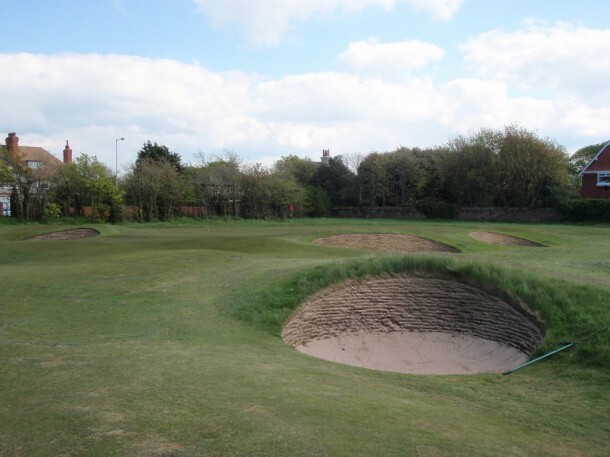 The second green and a sample of the green complexes that await the golfer at Royal Liverpool. We returned to Wales to play North Wales Golf Club and Conwy. Conwy serves as an Open qualifier course. Then it was off to London with tired feet for one last round before heading home. 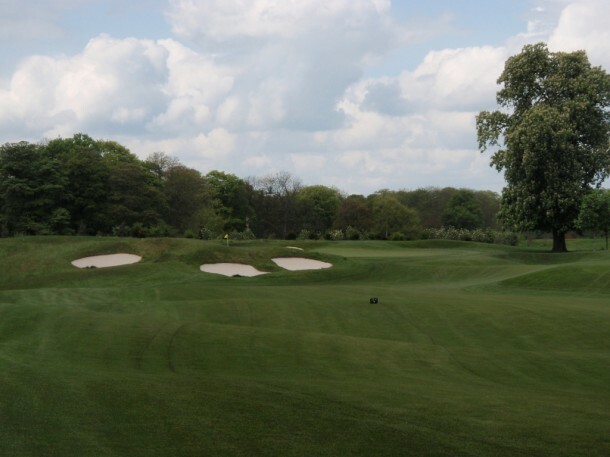 We decided to play The Grove, a resort course outside London that hosted the 2006 American Express Championship won by Tiger Woods at –26. Though we prefer the links courses this is a superb layout and in perfect condition. Looking back from greenside on the 5th hole at The Grove. The green on the 13th at The Grove. 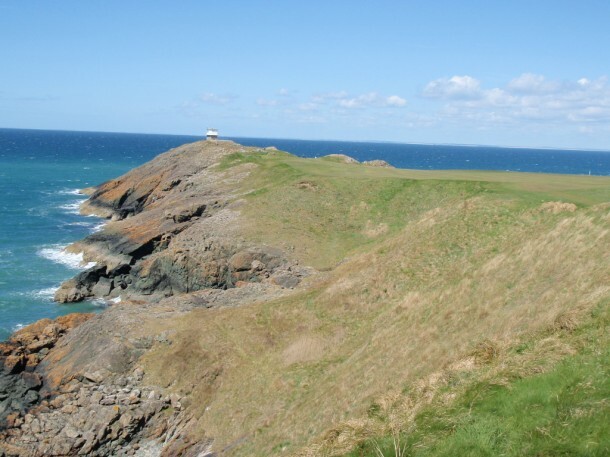 We walked 214,397 steps through 15 courses in Wales and England and not a golf cart in sight. Golf as it was meant to be. Tom Bielanski – A walking golfer. Great stuff…I’ve never considered a trip there, but after the pics and reviews, I think i’d have to seriously consider England/Wales for a trip in the future. Typically when i’ve considered going there…Scotland and Ireland were the first that I’d think of. yet to play wales but the english collection of Open venues is one of the best links trips there is. Planning a trip to Scotland for the summer of 2015. Isle of Arran, Kintyre penninsula, Islay, Colonsay are all of interest. Prestwick, Troon south of Glasgow and perhaps a ferry over to Northern Ireland. 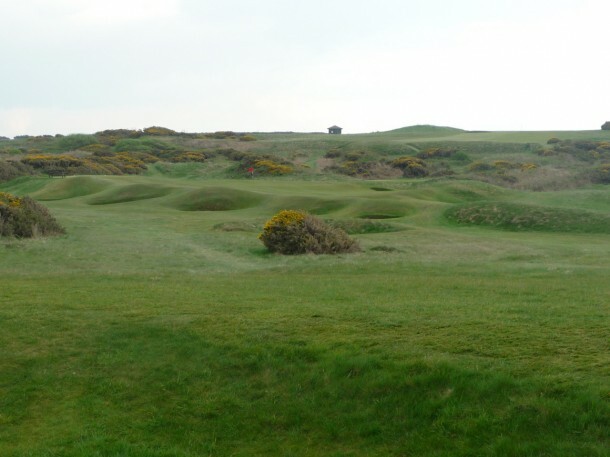 Aiming for fun, inexpensive, true links courses in the “machair” . . . in that order. Anyone have comments or suggestions? Went to Scotland last year. Had a great time, played some wonderful courses. 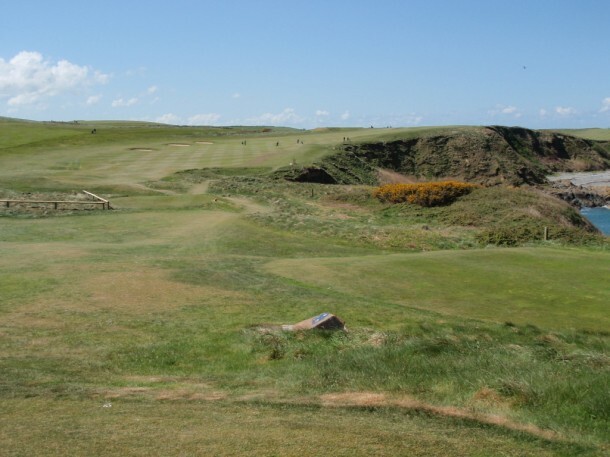 Started at Isle of Aran, played Shiskine — great 12 hole course, true Scottish golf (who said golf should be fair?). Over to Mull of Kintyre, drove past Macrihannish (couldn’t get out, Saturday tourney — raining like crazy anyhow, but still groups on the course). Headed south, played St. Andrews New Course (couldn’t get on the Old, possibly due to graduation crowds and also club meeting – tourneyscheduled the next day) which was nice, good views, wound around with Old. Played at Braid Hills #1 in Edinburgh (really neat course, beautiful views down over Edinburgh). Down to England, didn’t play down that way, but did play Powfoot heading back up to Glasgow. Nice low key old links course. Loved the golf everywhere. I was a single so was able to generally walk on, often played by myself but any locals were always great. Think I saw one or two carts all together, generally used by persons with disabilities. Scotland, especially in the north, is way north …. sun didn’t set until 10:30, so could play until very late. Got lucky with the weather; pounding rain in Aberdeen, but was sunny up the coast at Cruden. Liked the friendliness and unpretentiousness of the courses. Few have ranges; I asked about somewhere to hit some balls while waiting for tee time at Royal Dornoch, and they directed be to a little driving net enclosure in the parking lot. While that might upset some, I found it great. Loved how the GPS directed me to drive across Granny Clark’s lane across the 18th and 1st fairways at St. Andrews Old. And we did it again the next day when the meeting (i.e. club tourney) was on, but this time there were people stationed to hold you until the golfers cleared. Lots of the courses have walking trails beside or through them. Price-wise (a consideration because our goal is to stay for the summer) I found some excellent value on the Kintyre penninsula, on Arran and the western isles and the Hebrides. Also, there are so many manicured, spendy courses in Canada and the US that I feel like I’d like to experience more of the quirky and traditional links courses. Not coincidentally, some of these offer lower green fees. Courses that offer a one week or two week “packet” are appealing. Arran has a “Golf Arran” package. Another wrinkle would be to play open “fixtures”. A bonafide handicap and (in some cases) a course membership is all that is required. That would be a lot of fun and would also be a terrific way to meet members and locals and get on the courses for not a lot of $$. Arran and Kintyre penn. have excellent hiking and bike tour opps – true for Wales too, sounds like. P.S. – Colonsay, an island west of Kintyre penninsula with a population of 100, has an 18-hole links course, a brewery and a distillery. My kinda place! glad you enjoyed Wales! 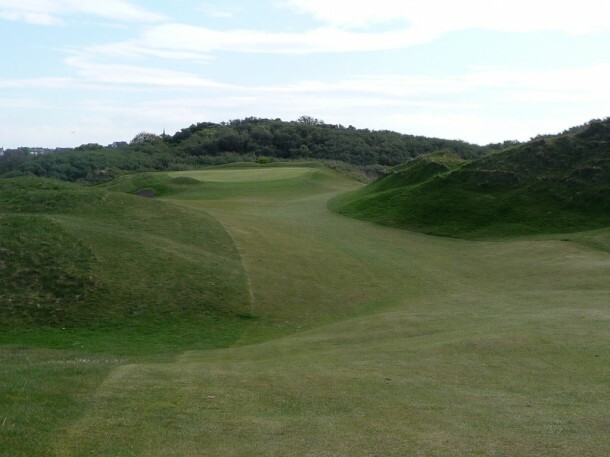 now live in Australia but originally fron llandudno so the “north wales golf club”was my first ever golf experience,i particuarly remember the two short par 3 holes back to back, 16 & 17 i think? as a youngster i had an agreement with the young scottish pro of the day that one bag of reclaimed course find golf balls equated to an early morning green fee ticket for dawn on a saturday! great guy always helpful and generous (even if he did sell the balls for 30p each!) gave me several old clubs etc,anyway glad you enjoyed your trip and glad i discovered this site,playing my best golf since going minimal,now carry 3W,22H,6,8,PW,SW,PUTTER all in a super light titleist pencil bag,i find i make more effort to play now i just grab my clubs and walk as oppose to all the faffing arount setting up trolleys etc. Cheers and keep walking!